Growing coconuts outside the tropics? How can this be possible? After all, we all know that coconuts can’t take frosts. If you drive on I-95 through my home state of Florida, it’s readily obvious where the coconut palms start. It’s like a line you cross somewhere a little north of Palm Beach… and then there they are. Florida isn’t a tropical state for the most part. It’s close, but not quite. North of the southern tip of the state, with the exception of a few sheltered areas, the coconuts disappear. On my north Florida homestead a bit south of Gainesville, it was impossible to grow coconut palms. The overnight lows would sometimes hit the teens. On one night, I measured a low of 12F. That’s 20 degrees below weather that can kill a coconut palm. So I did some thinking about coconut palms and the way they grow. First, they need warmth year-round – or at least protection from freezing weather – and they need space to reach maturity. Let’s see how this could possibly be done. A greenhouse is the logical option for growing coconuts outside the tropics, right? Sure… but do you have any idea how tall coconut palms can get? The full-sized varieties can almost hit 100′, so that’s obviously not going to work. Fortunately, there are dwarf varieties of coconut palms that will bear fruit at around 8′ tall and only get perhaps to 20′. My favorite inexpensive greenhouse has 9′ clearance in the middle. Let’s just say we’re growing in one that has an 8′ roof. That’s pretty normal for a backyard greenhouse. So the only place to go… is down. Dig a pit beneath the greenhouse and put the greenhouse over the top of it. This will gain you another 6′ of headspace. Very good objection – but think about it further. Have you ever seen pictures of coconut palms growing sideways along the shoreline? Coconuts have the ability to be blown sideways, then recover, bend upwards and keep growing. What if we used that ability to our advantage? It’ll be fine – don’t worry. It looks sad now, but wait! 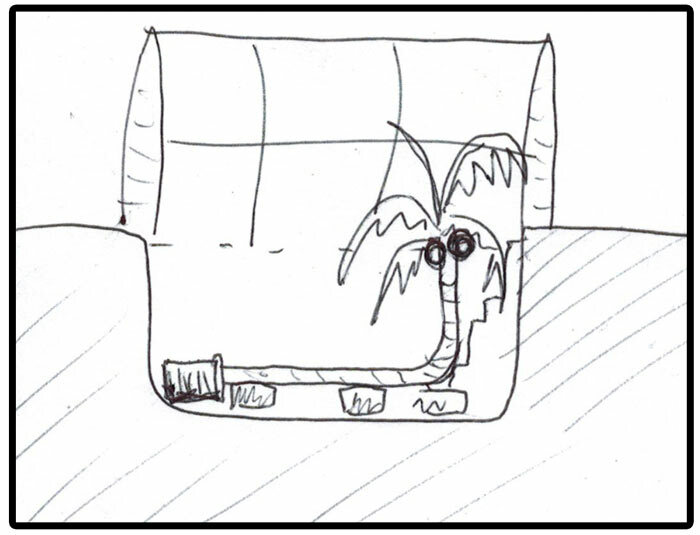 When you lay the coconut palm on its side, I’d also put a couple of blocks beneath the trunk to support it, which also would make it into a sitting bench for one side of your greenhouse. 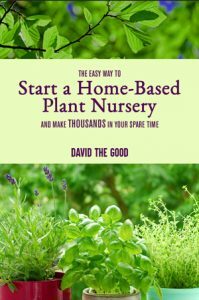 Now your greenhouse coconut palm tree can hit its full, productive size without knocking the top off its shelter… and you could potentially produce your own coconuts far from the sunny tropics. 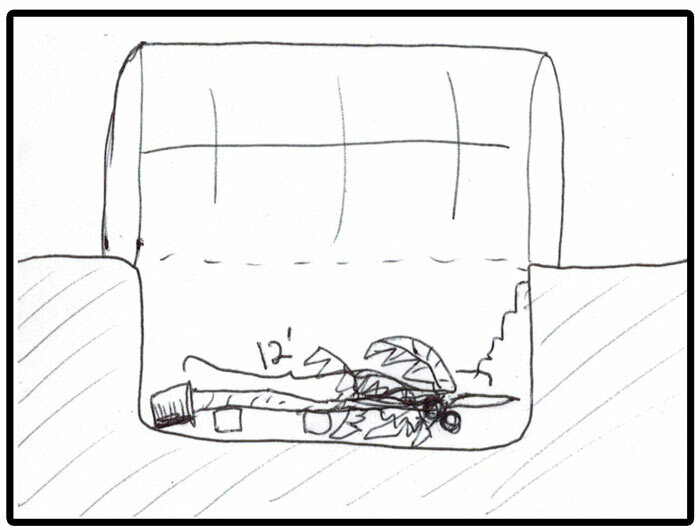 Since I haven’t tested this idea, I can’t say for sure if it will work. My gut says it will, judging by what I’ve seen of coconut palms as well as the fact that I’ve seen a pit greenhouse like the one in the drawings. It hosted jackfruit, starfruit, miracle fruit and other completely tropical species despite the fact that it was located in a cold part of Florida at least 3-4 hours from where those species can survive. If you live much further north, you would have to keep the greenhouse heated. Barrels of water work here in North Florida but I’m sure they won’t work in places with extended periods of below-freezing weather. Up in Tennessee you’d likely have to have a double-insulated greenhouse with a heater. In Minnesota, you’d have to own a power company to keep it warm enough. That said, for those of us that can’t stop experimenting, the pit greenhouse idea opens up a lot of possibilities for growing encapsulated mini food forests with productive species hailing from regions much further south than our own. In South Carolina you could grow citrus trees this way. In Canada you could grow Japanese persimmons. I planned to eventually build a greenhouse like this and grow at least a couple of coconut palms in it just for fun… but now that I’m moving further south it’s not going to happen. 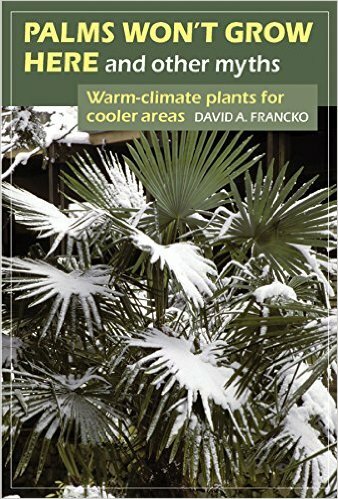 Other possibilities for growing coconuts outside the tropics and for growing tropical plants in regions where they’re not “supposed” to grow are discussed in the fascinating book Palms Won’t Grow Here and Other Myths by David A. Francko. Though the book is focused on ornamental species, the ideas Francko unlocks are worth the price of admission. 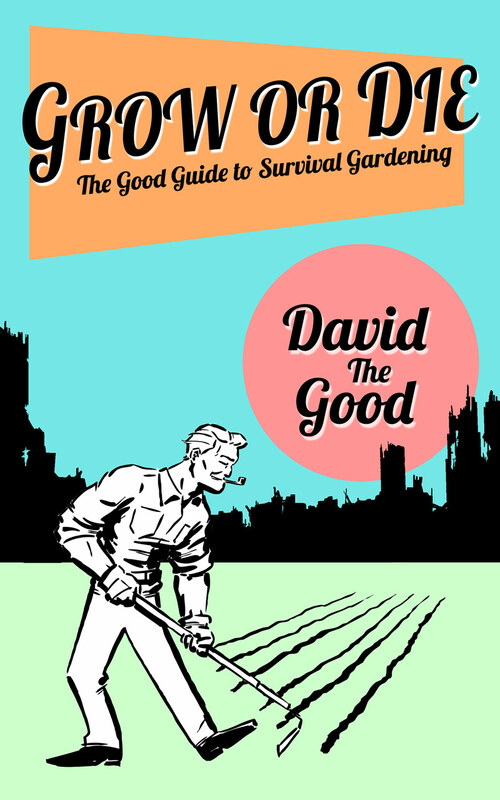 Actually, I should invite him to join me on The Survival Gardener Podcast. The man has done amazing things and it’s fun to hear about just how crazy you can get with pushing growing zones. 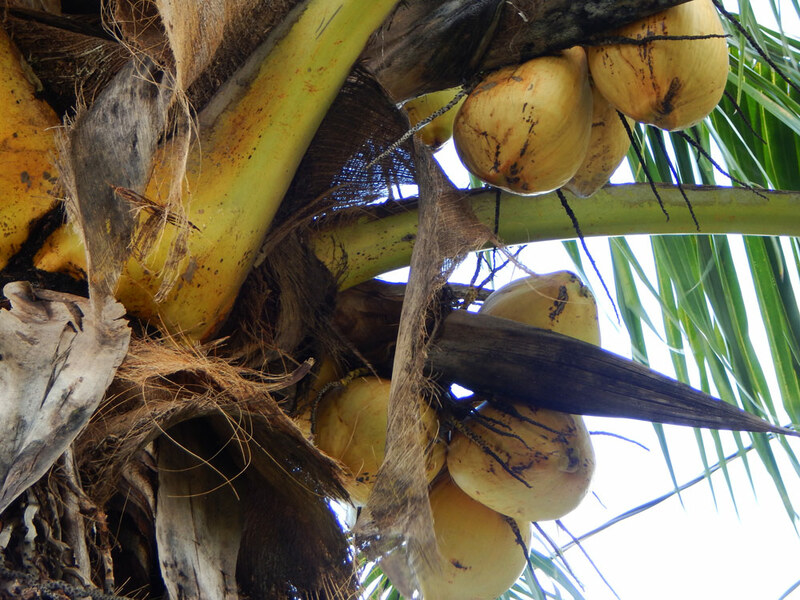 So – anyone up for the challenge of growing coconut palms in a temperate climate? Pick up the torch and make it happen – I’m dying to know if the idea will work. Tell me if you pull it off. 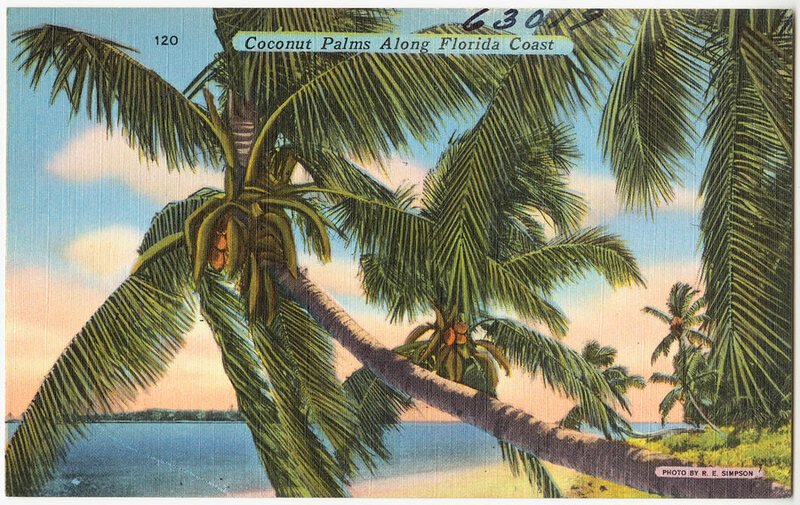 *Coconut postcard image courtesy of the Boston Public Library. Creative commons license. Yahoo! I would love to hear a podcast from you and Mr. Francko. I have been interested in the underground green house idea since you brought it up in a video a while back. I have so many “irons in the fire” at the moment so I do not know when I will get to it. It is on my bucket list. 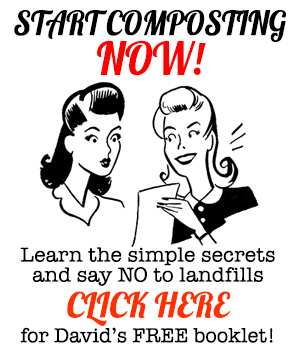 Right now, I am trying to get some “free hot tubs ” for my aquaponic area. The problem is I will need to pay for the transport of 150 bucks or more.. so not so free.. but perhaps a good investment. My wife thinks I’m goofy… she is right on that score. I am from the Ft. Lauderdale/Miami area and grew up with coconut palms along with other tropical and I miss them here in Deland. This sounds like a good way to have the best of both worlds. Question… digging to 6 feet.. seems a bit much… wouldn’t it cause to much shade for the plants on the bottom? I have to pay transport costs on two of mine. Another one was just a fiberglass shell and a friend helped me maneuver that one into place without hiring anyone. 6′ is a lot, you could try 4′. I wouldn’t worry much about the shade, though – there’s a lot of daylight through the middle of the day, plus coconuts can grow in the shade, though they won’t fruit until they get good sun (which would just be a matter of growing taller). These are Walipini greenhouses and there are sites that say you can build them for under $300, if you do all the shoveling yourself. Permies has covered adding a rocket mass heater to a & Walipini greenhouse there is a video out there somewhere. Thanks for the links, BGS. The Garden Pool people are quite inspiring – I actually shared their site with my pastor a few days ago. also … what variety of dwarf coconut would you recommend for this sub greenhouse.. and what other delicious tropical would be good to grow in the space remaining? Fiji Dwarf, if you can find it. Probably have to call UF and ask them for some. However, I’d try it by planting nuts from any of the shorter palms growing down south if I couldn’t find those. Various Malaysian varieties. I would like to try it! But I need to finish some other projects first. Do you have to keep it in a pot after you tip it over or would it be better to bury the base at that point? Would adding a water barrel to the greenhouse protect them further or it unnecessary in zone 8? How do greenhouses hold up here with winds? I would also enjoy the podcast interview. Thanks for this very interesting and inspiring post. I’d probably cut the pot away and let it settle into the ground. In zone 8, water barrels would likely be necessary. A well-built greenhouse does fine in the winds here; however, you need to anchor it to the ground securely. I dug 3′ holes with a post hole digger, put a 4′ piece of rebar into the middle of the hole and poured concrete around that, then clamped my greenhouse posts to that. 8 of those kept it as firm as a rock. I’m thinking about our water table here in Central Florida. Digging six feet seems like it would just invite flooding. Might have to build up a hill before digging down…? Yeah, that would be an issue. Our water table here is about 35′. I would probably try to raise the sides of the greenhouse in that case, perhaps by building up a couple of feet with a small wall and letting the greenhouse continue on top of that. Thank you for the wonderful information provided. I am looking if anyone of you can help me out with this. I am trying ship from Sri Lanka to Dubai few coconut palm trees grown in coastline in the country. It will be a transplant of a palm tree. Hoping to ship with the dirt ball and stuff. Do you think will it survive. Have anyone experienced it before. Appreciate your help. Will it survive the shipping too pls. Would the palm survive if it was turned twice? If the greenhouse wasn’t that tall or long, would you be able to tip the tree over the first time, and then rotate the base 90° so the vertical part was, again, horizontal? 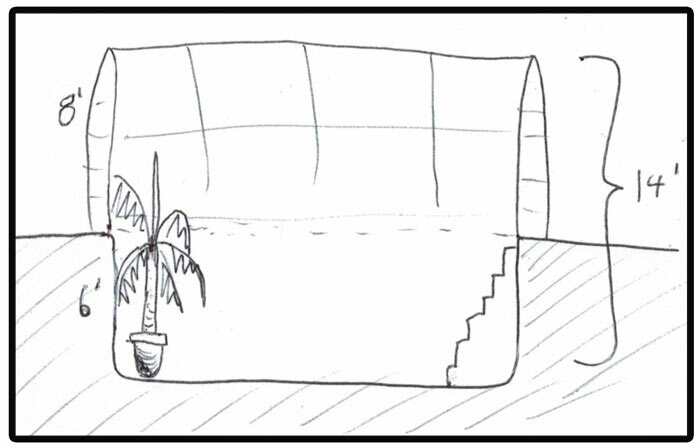 In such a way, there would be tree trunk across two walls of the greenhouse and, therefore, require less clearance/a smaller (read: more easily heated) area? I believe it would almost certainly live, yes. They are very good at reorienting themselves. And great idea!